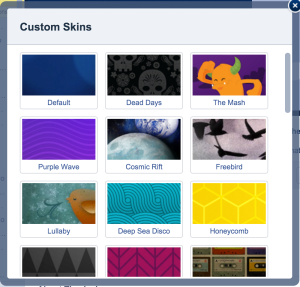 So, it’s bothered me for a while now that there appears to be more skins in Pandora One than what you can easily access. Today I decided to find out what was in there. Turns out there are 6 skins you may not know about. If you scroll all the way to the bottom of the dialog, you may notice that there are more skins that you just aren’t able to get to. Well, with a quick manipulation of the CSS, we can see what is hidden down there: 6 NEW SKINS! Sunny Day, Winter Leaf, Blue Sky, Sasquatch, Pool, and Beach. I’m now sporting the Sasquatch skin for Pandora. Some people may already be able to see these, but for those that can’t, just wanted to share what you might be missing out on.